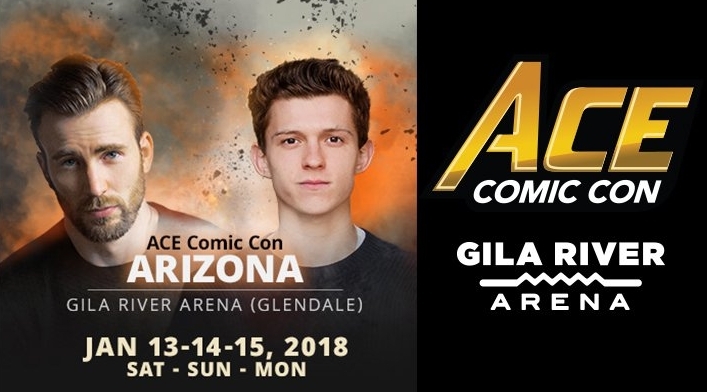 A banner ad for Ace Comic Con Arizona. The first time I heard of ACE Comic Con was through a sponsored Facebook post I caught while mindlessly scrolling. I thought to myself, “How the heck have I never heard of this before,” and after a few clicks, quickly discovered it was brand spankin’ new. It’s Arizona show already had an A-list roster, and would be ACE’s second ever convention. I needed to know how it was going to compare to more “established” comic conventions, so my fiancé, Ryan, and I took to the arena floor to find out. Gila River Arena in Glendale, AZ. As we walked up to the arena on the sunny Saturday afternoon, we saw the line for general admission was quite long and wrapped well around a building opposite the arena that divided into smaller lines in front of multiple security checkpoints. 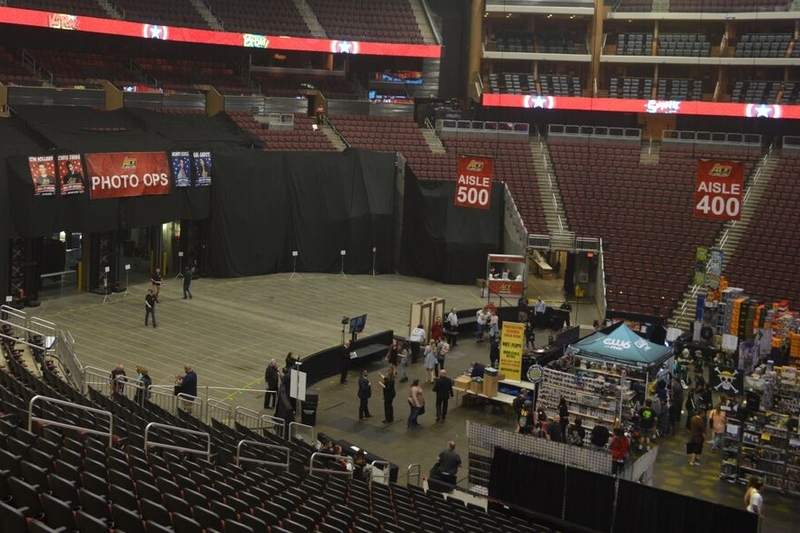 Fortunately, the Gila River Arena is used to large crowds, so every checkpoint was armed with several security staff to help the line of attendees enter as quickly and smoothly as possible. Despite the well-organized lines and quick security, some attendees spent almost two hours waiting to get through and grab their passes. ACE had established a separate entrance for its VIP pass holders on the opposite side of the arena, whom were able to enter prior to general admission pass holders. By the time we had arrived on Sunday (two hours after the floor opened), there were no lines of people waiting to enter - which was a stark contrast to other conventions we’ve attended where people have waited multiple hours. Inside the arena, ACE had laid out their convention on three different floors; the arena floor, the main concourse, and the upper concourse. The arena floor housed the main-stage panels, second-stage panels, photo-op areas, and a handful of exhibitors. The rest of the exhibitors were spread out between the main and upper concourse, with the creators located on the main concourse. The main concourse also housed the kid’s convention area where little ones were able to enjoy more age appropriate activities. Celebrity guest booths were placed on the upper concourse. Having the three levels made it easier to find what you were looking for, helped to make foot traffic flow freely, and at no point did either of us feel like we were canned sardines shuffling to our next destination. Watching the panels from the arena seats above the show floor. The main stage (with a packed-in audience) behind the show floor. The photo ops section was in a seperate area. ACE had introduced a new way of making panels accessible to all guests, regardless of where you were located inside the convention. This was something no other convention we’ve attended has done, and was a huge upsell for us. To view a celebrity panel up close and in person you had to have a pre-purchased ticket. However you were able to view the panels from the upper concourse seats quite easily, from the dozens of television sets scattered throughout the main concourse or the jumbotron located in the exhibitor hall behind the main stage. Gone were the days where you had to rush to one side of the convention center to the other, and stand in a long line hoping you got the opportunity to view the panel before all the seats were taken. It was awesome. We were able to see everything that the convention had to offer within two hours due to the quantity and exclusivity of the exhibitors. On the one hand, this was nice because it was easier to plan what you would do. On the other hand, it felt very repetitive because you were frequently walking by the same vendors multiple times a day. Unlike other conventions there were extremely limited workshops or panels that didn’t consist of celebrities. When combined with the exclusivity of exhibitors, this sometimes made us question if the convention was worth paying the high price for a whole weekend (a full weekend pass was $95 if pre-purchased or $100 at the door - ed). ACE was focused on bringing the A-list experience to everyone, but felt a little more geared to the mainstream comic fan due it’s focus on exclusivity. It’s best for convention goers who want to see specific celebrities or a have a one-day experience, but it may not satisfy the convention goers who like to explore the many aisles of exhibitors and find new things. It was a new style of comic convention that was fun to attend, and we’re glad to say we were a part of ACE’s infancy. Will we go again? Time will tell, but we are excited to see where the future of ACE Comic Con is headed. Captain America #695 Ace Comic Con Arizona Exclusive, cover by Billy Martin. Captain America #695 B&W Ace Comic Con Arizona Exclusive, cover by Billy Martin. Many of the creators invited have done amazing work for Marvel, which was the theme of the convention. The Marvel theme of this convention was reflected in the celebrity guests. Emily loves cats. And Jason Mamoa.